Sometimes back a photograph published in a national daily attracted my attention. The photograph depicted a festival celebrated by the residents of Khokana located in the south of the Kathmandu valley where they were ripping apart a live goat. As a matter of fact, what they were doing was a part of their culture. The very next day after Gaijatra a goat is flung into Deu-pond (Pond of Gods) near the local Rudrayani temple. Some strong and fit men are chosen by the community to enter the pond to locate the animal. 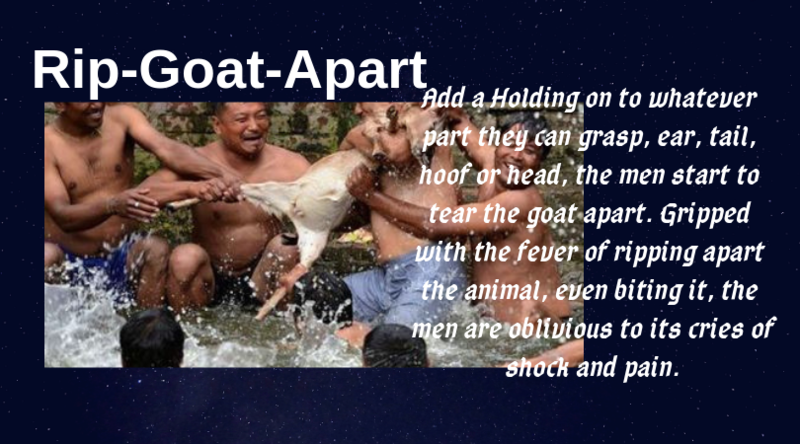 Holding on to whatever part they can grasp, ear, tail, hoof or head, the men start to tear the goat apart. Gripped with the fever of ripping apart the animal, even biting it, the men are oblivious to its cries of shock and pain. Just imagine the sight of a goat being torn apart with hands and teeth. For the members of this community, it is a part of their culture and tradition. But to others, the scene would appear to be barbaric and grotesque. We also have other traditions like the Deuki system in which one of the daughters of a family is made to serve God in a temple. Then there is another festival in which some men pierce their tongues with iron needles. It is about time we gave a serious thought to such traditions. According to a western school of thought the civilization is based on culture. People define themselves in terms of ancestry, religion, language, history, values, customs and institutions. They identify themselves with cultural groups, tribes, ethnic groups, religious communities, nations, and, at the broadest level, civilization. Can those following this type of culture be a part of civilization?